Mural artists Josh Powell and Wythe Bowart, aka the Bristle Bros. were commissioned by the city of Hayward's Historical Society to paint a giant mural, so our 90' paint frame was put into action by these talented gentlemen. Take a look at a time lapse summary of their process. 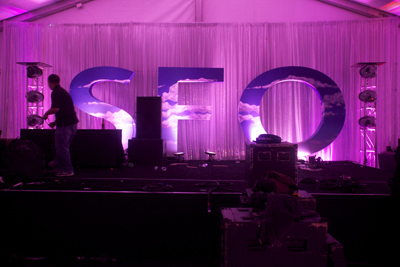 Presentation Services at the St. Regis hotel in San Francisco contacted John Murray Productions, Inc. when they needed a high end, clean and simple set for the Starwood Hotels Sales Kickoff event taking place this Spring. While the majority of the event was being held nearby at the Moscone center, high level executives were invited to a private event at the St. Regis in the Gallery ballroom. The set consisted of a 50' wide by 14' tall bright white flat wall, with two screen surrounds flanking a center window featuring the hotel's logo on a back-lit stretched fabric. While the stage was dressed minimally with seating for two and floral decor, the up lit flat wall and color changing center graphic allowed for a change of scene throughout the event. The result was clean and polished, and right on par with the level of sophistication expected from the St. Regis San Francisco. Since our inception in 1989, John Murray Productions, Inc. has consistently grown in our capabilities. From a modest office space to a full scale scene shop, we have continually built our repertoire of skills, allowing for control over all aspects of the products and services we provide. Now meet our latest addition, a Shop Bot CNC router! This versatile machine can cut any vectored shape out of wood, plastic, metal and more. This amazing piece of machinery joined the shop at the end of 2011, and has already been put to great use. Now we have the capability of designing and fabricating a full range of products in a fraction of the time we may have previously spent, allowing for a more efficient and productive workshop. 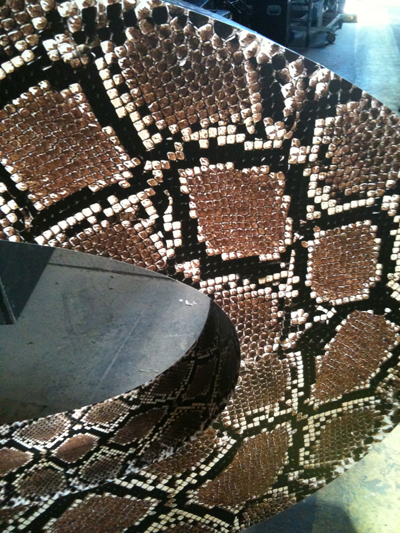 And with 2012 off to a swift start, the Shop Bot could not have come at a better time. 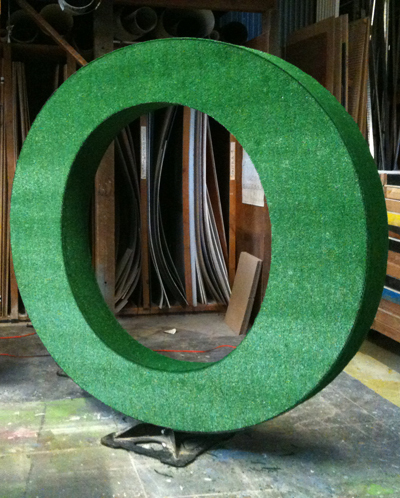 From complicated custom built furniture to dimensional logos, the possibilities are endless! Feel free to contact us for your next custom build. In the meantime, check out the new machine in action by clicking here. 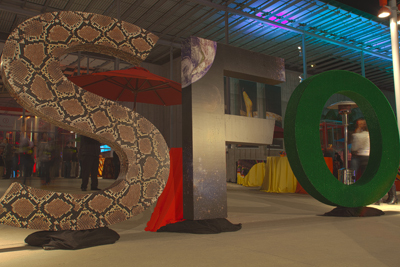 In conjunction with InVision Communications, John Murray Productions, Inc. designed, fabricated, and installed the set and lobby environment for the Silicon Valley Bank CEO Summit, held at the Computer History Museum in Mountain View. 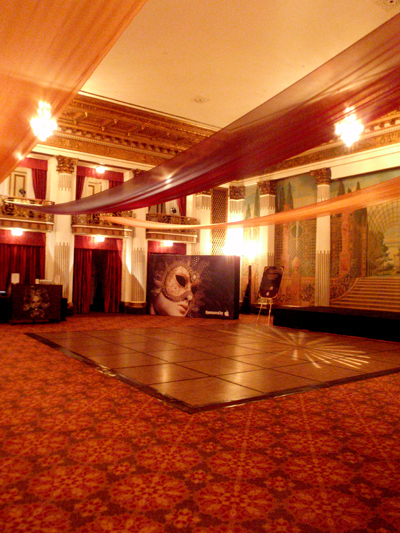 Guests of the event were greeted with stair graphics that led up to the second floor where the event was held. The set featured five 4'x12' flats, wrapped in graphics created on our large format printer. Six matching banners were hung on the left and right side of the meeting room, creating a nice balance within the space. The look was finished with our Glo lectern and assorted leather seating. For our third year running, John Murray Productions, Inc. was proud to be a part of the JCK Las Vegas watch and jewelry conference. The conference recently moved from the Venetian hotel to the Mandalay Bay Hotel, which created new opportunities and challenges! This year we serviced 4 brands with their build-out of individual top-floor penthouse suites from regular hotel suites into custom showroom/office environments. The main use of each space was for invited conference attendees to get a closer look at new products in more detail than on the trade show floor at the hotel. The challenge came in turning the suites into workable spaces considering we had to completely start from scratch, removing all existing hotel beds and furniture and redesigning each suite from the ground up, including: custom flooring, drapery and office partitioning, custom watch displays, visual branding, furniture, AV and lighting. With Spring comes new growth, life, and of course fashion! Chanel's Spring 2011 line was celebrated at Neiman Marcus with a private in-store event that highlighted the new line, and John Murray Productions, Inc. was brought on to provide the environment. 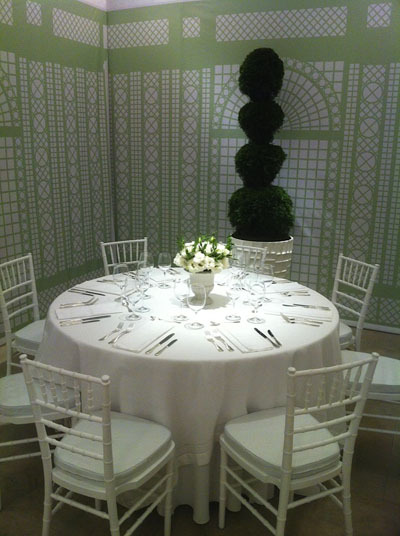 Utilizing three 10'x25' custom trellis prints as walls, we created a garden-like space within the store for guests to enjoy a meal and preview the new line. We began at the Neiman Marcus in Palo Alto, then made our way to San Diego, Irvine, and eventually Bellevue, WA where each of the stores hosted a Chanel preview event. The challenge came in creating an identical look in non-idential spaces, repurposing the graphic prints in 4 different stores along the west coast. The look was classic Chanel- clean, polished and contemporary. John Murray Productions, Inc. worked together with the creative team at Lodestar to come up with the environment for their annual Conference and Staff Awards Ceremony. 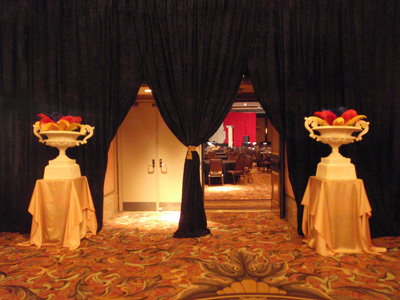 The three day event took place at the Sofitel Hotel in Redwood City this January. 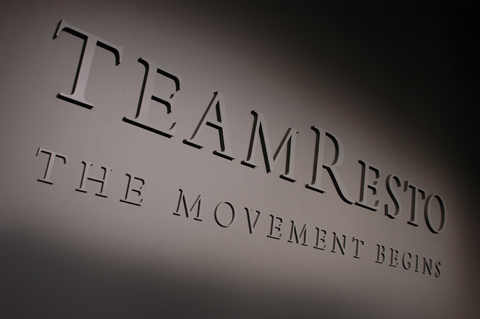 The challenge was to create a streamlined look highlighting the company's new brand imaging. 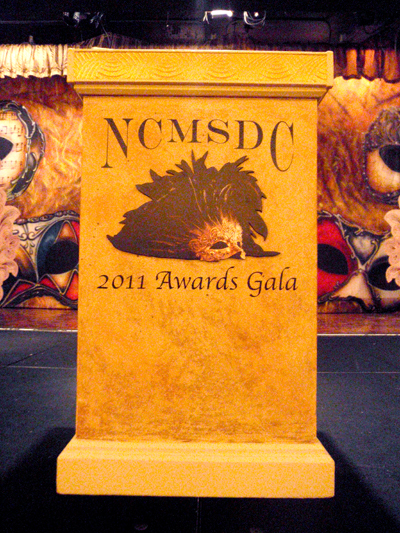 We achieved success by creating a 63' x 14' wall which served as a projection surface as well as a screen surround. We completed the feat by creating a wall of flats which were then covered by a seamless printed matte vinyl. Once applied, the area for the screen was cut away from the vinyl, and the 16' x 9' rear projection screen was put in place. The white material made for an excellent projection surface, allowing the look of the event to transform throughout the evening with creative lighting design. We also provided custom printed table tops incorporating the company's logo, and over-laminated with white board material so guests could use the table as a writing surface. Photos courtesy of Robert Hatch Photography.